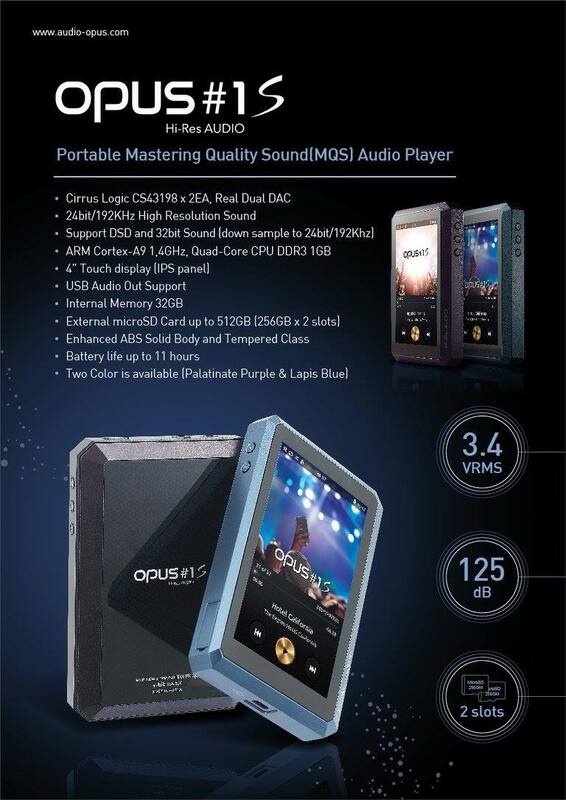 Audio Opus recently revealed their upcoming hi-resolution portable digital audio player – the OPUS#1S. Yes, it’s an OPUS#1 with an “S”. The company’s first DAP is the OPUS#1, which was released early 2016. The company entered the market prepared and there were many who got hooked with the Opus#1’s sound performance and signature. Thanks to Opus#1’s success, the company was able to release the Opus#2 and Opus#3, Q4 last year and Q2 this year respectively. 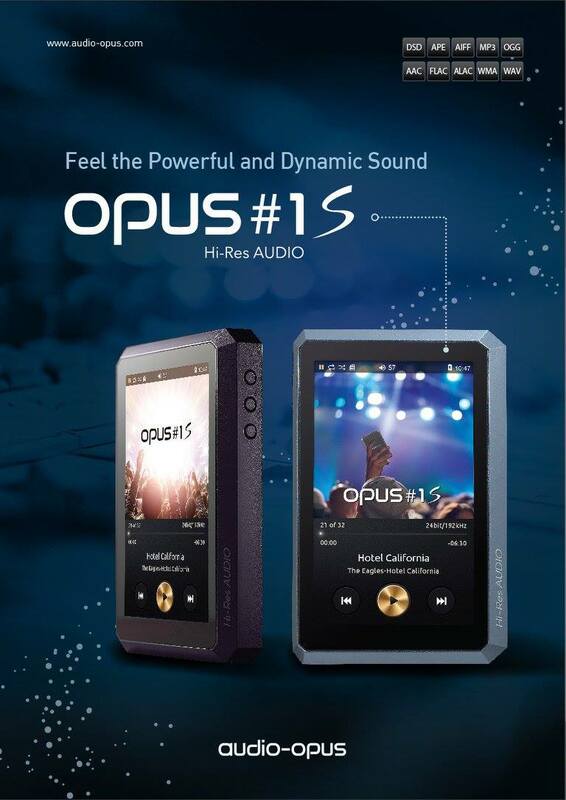 And now, they will be releasing an improved version of their first DAP, the OPUS#1S. I’m a little bit disappointed since I was expecting something really new from the company, but it seems that we won’t be seeing something really new from them until sometime next year. Perhaps Opus#4? So what’s new in the Opus#1S? How does it differ from its predecessor and what sort of the improvements are we going to expect on the new Opus#1S? Continue reading below. Basically speaking, the OPUS#1S is an improved version of the OPUS#1. They look very similar in many ways, except for the “S” on the name at the back. It still features a DUAL DAC setup, but it’s now using a newer CS43198 DAC chip from Cirrus Logic. I see they (Cirrus Logic) added “1” in the middle. Aside from the newer DAC chip, some of its specs where improved; like the output level, signal to noise ratio (SNR), crosstalk and Total Harmonic Distortion plus Noise (THD+N). 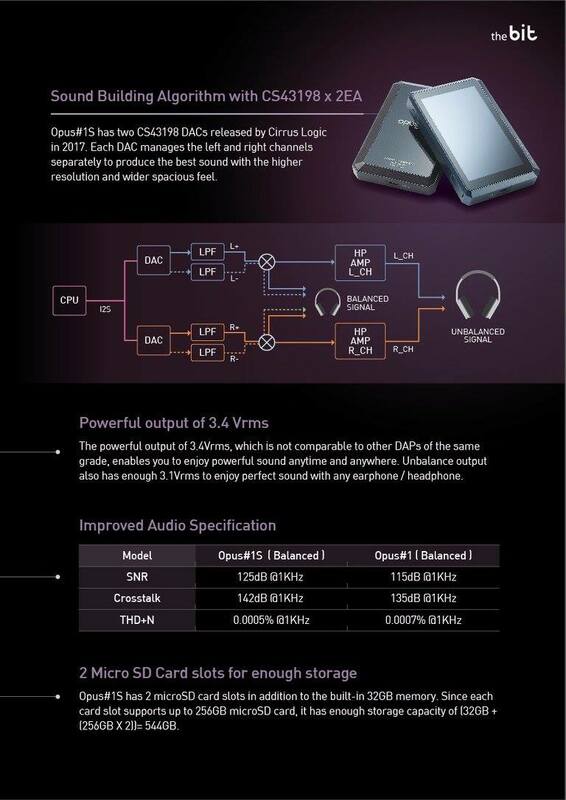 Oupus#1S has an output level of 3.4 Vrms for the balanced connection and 3.1 Vrms for the unbalanced connection. SNR is at 125dB @1KHz balanced and 123dB @1KHz unbalanced, meanwhile crosstalk is at 142dB @1KHz balanced and 140dB @1KHz unbalanced. Finally, for the THD+N, balanced connection has 0.0005%@1KHz and unbalanced connection has 0.0007% @1KHz. 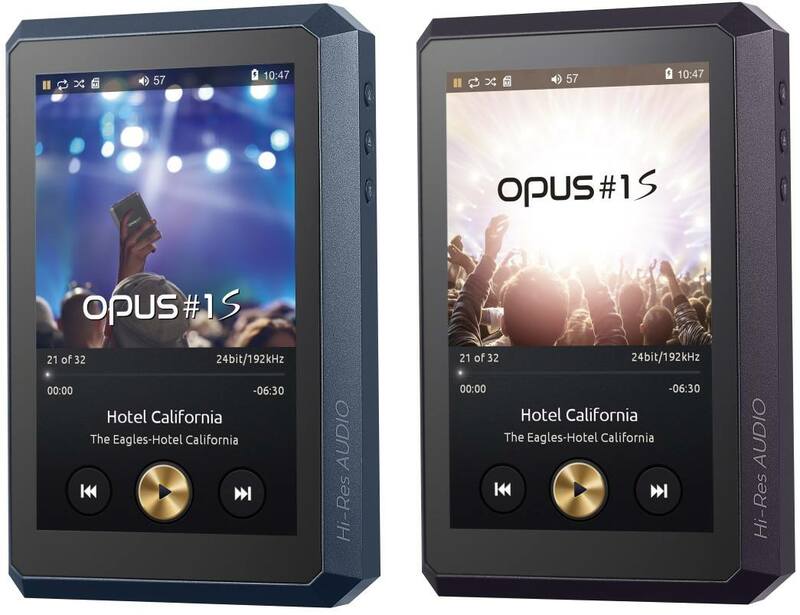 Aside from those mentioned above, the OPUS#1S has the same specs with the OPUS#1 like: screen size, CPU and memory, OS, battery and battery life, storage, dimensions and etc. The OPUS#1S does come in two new colors: Lapis Blue and Palatinate Purple. Although the body is still made out of ABS plastic and tempered glass. With those improved specs, I expect that the OPUS#1S can drive IEMs or headphones better. Although I’m not sure if the company altered the sound signature. Probably not, but hopefully the sound quality would be better in terms of body, texture, details, clarity and other characteristics. I’m not expecting it to surpass the Opus#2 and Opus#3 audio quality, but I am expecting it to be better than the Opus#1. You can check out more details from the specifications table below. 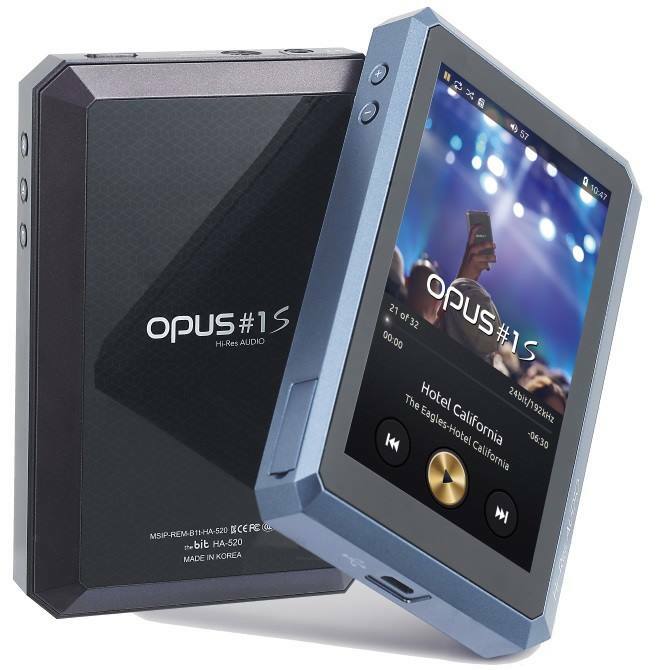 UPDATE: The Opus#1S portable digital audio player is now available on Amazon.com here. As of today, Audio Opus hasn’t revealed as to how much will the OPUS#1S cost. Most probably, the MSRP will be similar when the OPUS#1 was first released, around $599 or less. But I am hoping they would price it (a little bit) lower to compete better with other entry to midrange DAPs. Pioneer, Onkyo, Fiio and other companies are getting aggressive with their latest DAPs. Pumping more features, improving sound quality at the same time keeping their prices competitive. We expect to learn more about the OPUS#1S and when will it hit the market towards the end of this year or early next year. Below is the specifications table of the OPUS#1S vs OPUS#1. As you can see there’s not much difference except for the bold text. Next story Meze Audio Empyrean Isodynamic Hybrid Array Headphone – Company’s First TOTL!